Teeth, gums, and the rest of the oral cavity need extra care and attention if you want them to stay healthy in your later years. Aging isn’t always pretty, and your mouth is no exception. A century ago the need for dentures in later life was almost a foregone conclusion. Today, three-quarters of people over 65 retain at least some of their natural teeth, but older people still suffer higher rates of gum disease, dental decay, oral cancer, mouth infections, and tooth loss. While these problems are nothing to smile about, you can still do a lot to keep your mouth looking and feeling younger than its years. Teeth are amazingly strong. Your molars can bear down with over 200 pounds of pressure. But they’re not indestructible. A lifetime of crunching, gnawing, and grinding wears away the outer layer of enamel and flattens the biting edges. Tooth surfaces are also affected by exposure to acidic foods such as citrus fruits and carbonated beverages, which dissolve the protective enamel. Weakened enamel can set the stage for more serious dental problems. A crack or break in the tooth’s outer surface leaves the delicate pulp tissue vulnerable to irritation and inflammation. And, since the nerves at the tooth’s core lose sensitivity with age, the problem may be well advanced before you notice any pain. If an infection develops, you could need a root canal procedure or even lose the tooth entirely. The chance of having tooth damage severe enough to require a root canal or similarly invasive procedure triples once you’re over age 65. The consolation prize: reduced nerve sensitivity means that procedures that may have been uncomfortable for younger people could hurt less if you are older. Just because you’ve got a few gray hairs doesn’t mean you’re out of the woods when it comes to cavities, either. The rate of tooth decay in people over 65 now outpaces that of schoolchildren. A prime target of dental caries in older adults is around the neck of the tooth, adjacent to the gum line. 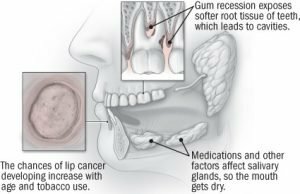 Gum tissue naturally recedes with age, so the soft root tissue becomes exposed. In addition, adults who grew up before the advent of fluoride products and dental sealants often have fillings from childhood and adolescence that eventually break down. Decay around the edges of those fillings is also a problem. While there’s not much you can do to stem the natural attrition of the tooth surface, the pillars of cavity prevention — brushing, flossing, and regular cleanings at the dentist’s office — remain the same at any age. People who have trouble brushing and flossing by hand because of arthritis or other disabilities should probably switch to an electric toothbrush. Fluoride, found in toothpaste, mouth rinses, and tap water in some communities, helps the body rebuild the mineral crystals that make up the tooth enamel and may also inhibit bacteria-laden plaque from adhering to the teeth. Fluoride rinses and gels, and varnishes applied by a dentist, may be able to halt the progression of root decay and in some cases reverse the damage. Visit your dentist at Diamond Dental Associates, LLC to help you maintain your beautiful smile.